Paddle kayak or SUP in one of the last wilderness and the paddlers paradise. Enjoy local food and live with the locals in your own cabin in the middle of nature. Stand Up Paddel, SUP, Paddelboarding this hobby has many names. 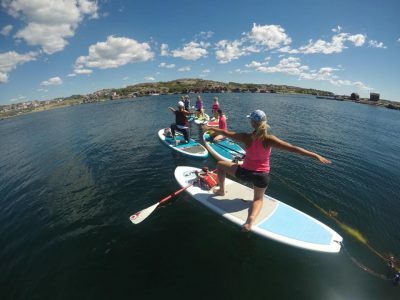 If you have not tried it before we suggest that you start with a guided tour or a intro tour where you will learn the basic paddling and safety techniques by our certified guides. If you have previous experience you can rent a board and head out and explore our magnificent archipelago on your own with your friends. During the winter we only offer guided tours with dry suits. Price: 650 sek per person / 1,5 h incl. 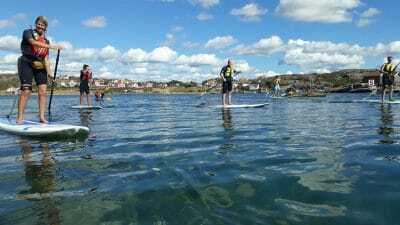 fully equipped SUP & ISA certified instructor. Welcome to explore our otherwise buisy archipelago when the summerbirds and guest has moved on. Now you can experience the same islands with new eyes and from a new perspective. It is less crowdes and less boats out which makes it easier to get closer to the nature and animals. 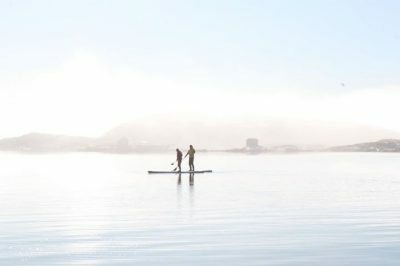 We offer secure and safe Stand Up Paddleboarding (SUP) tours with dry suits and experienced guides, read more about Winter Paddleboard Tour. Why choose when you can have it all. SUP + Yoga the perfect combo, taking balance and core exercises to a whole new level. While we strengthen and stretches our bodies we hear and feel natur around us, the wind, the birds, the motion in the ocean. Price: 650 sek per person / 2 h incl. fully equipped SUP & Yoga Alliance certified SUP Yoga instructor.